Small Flat Card Measures 5.5 x 4.25"
Foldover Note measures 5.5 x 4.25"
Flat Photo Card measures 5 x 7"
Stationery is priced to include one line of copy. 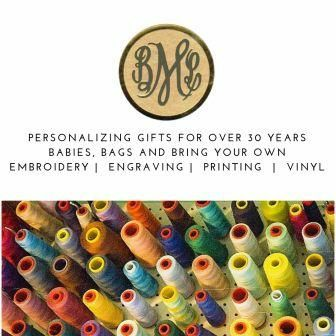 Monograms and initials are considered one line. Announcements and Invitations include up to 10 lines of copy. Additional lines can be added for $3 per line, please call us at 781-837-8430 for more assistance. Envelopes come in white and match the paper stock of your product. Two additional envelopes are included with each order at no extra charge. 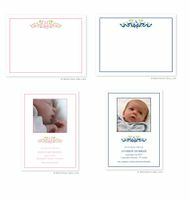 Photos for photocards should be emailed to info@bayberrymonograms.com. The dimensions should be no smaller than 1200 x x 1200 pixels. Rectangle format requires a rectangle photo shape. Photo will print exactly the way it is submitted. Please include detailed instructions if the photo is to be zoomed or cropped. We do not offer color correcting (including red eye reduction). Photos submitted horizontally will print horizontally and likewise photos submitted vertically will be printed vertically. All Large Folded and Long Flat Photocards can be ordered with pre-applied tape if you wish to apply your own photos. Please indicate if you would like this option. All orders can be gift wrapped for a $8 net fee and also a gift message can be ordered for $1.50 net fee. Please note Bayberry still includes free gift wrapping and gift enclosure for orders picked up at our store. Because this item ships from the manufacturer we are unable to offer this service to customers not picking up in store.